When you wake up in the morning and see that the sky is orange, your suspicious nature will probably urge you not to go out for a deep breath. I’ve seen worse; it was purple and pink once. The winter in Beijing is surreal. Pedestrians walking on the streets with gas masks, and the skyscrapers seem like they float on top of the clouds. 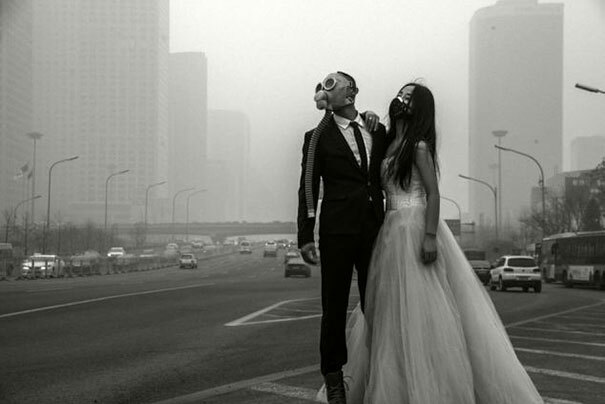 A series of engagement photos titled “Love at the Time of Smog” quickly went viral, where a young couple used their engagement photos to make a statement. Beijingers are asking: How did London get rid of the smog? In 2013, the fog and haze affected 600 million people in more than 100 cities in China. The smog in Beijing reminded people of the Great Smog of 1952 in London, where around 12,000 people were killed and 100,000 more fell ill. However, today the smog stops lingering over London. How London conquered the smog quickly piqued the curiosity of the citizens of Beijing. After the Great Smog dissipated, the British reflected on how to fight against the severe air pollution. This gave birth to the world’s first air pollution control bill, the “Clean Air Act of 1956.” Power plants in the city of London were closed, the industrial standard was raised, and large-scale transformation of traditional stoves was required. A series of air pollution control bills were subsequently issued for a variety of stringent emission constraints, including penalty measures. As a result, the fog days per year in London decreased from dozens to 15 days in 1975, and to 5 days in 1980. With the transformation of the industrial structure and lifestyle, new bills and strategies followed. The smog in Beijing is simultaneously similar to, and different from the Great Smog in London. It is similar because both stemmed from a fast and high energy- consuming industrialization. On the other hand, it is different because the pollutants that seized the cities are different. In the winter of 1952, from December 5 to December 10, high atmospheric pressure dominated all of England, bringing with it cold and foggy weather. People were using coal to warm their houses. At that time, the trams were being replaced with the internal combustion engine bus, which emitted huge amounts of exhaust gas. All factors acting together raised the sulfur oxides concentration, severely exceeding the ordinary level. By contrast, the main pollutants at the root of the smog in Beijing are PM2.5 and PM10, which stand for particulate matter with a diameter of less than 2.5 (and 10) micrometers. Unlike sulfur oxide, PM appears in solid form. PM10 can pass through the nose and reach the throat, and its smaller relative PM2.5 can further pass through the throat and reach the alveoli, where it can enter the circulatory system and cause greater harm. After a year and a half of research, the Beijing Municipal Environmental Protection Bureau released a report last Wednesday (October 29, 2014) shedding light on the source apportionment of PM2.5. This report first identifies that only 64-72% of the pollutant was produced locally. Second, automobiles, coal heating, industrial production, and dust are the top four sources of the pollutant, together accounting for 85.9% of the pollutant. Third, among the PM2.5 pollutant, 70% comes from secondary conversion of gaseous pollutants. After the diagnosis, experts issued a tentative band-aid solution: further restricting the issuance of automobile licenses; raising the industrial standard of emission of volatile organic compounds (VOCs) such as nitrogen oxide (NOx), sulfur dioxide, ammonia (NH3) and other pollutants that lead to secondary conversion; and controlling regional industrial layouts. The prescription is not yet official. Neither systematic nor forceful legislation or regulation has shown their claws. The future of the Beijing air remains unclear and worrisome.